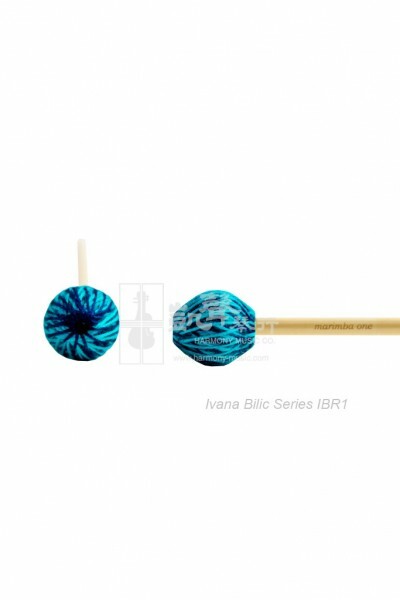 The Ivana Bilic Signature Mallet Series was developed to emphasize the singing characteristic of the marimba by relating the sounds each mallet makes to human vocal qualities. This is a mid-weight series with six grades of hardness, and is currently available with rattan handles. Ivana's series consists of five wool/synthetic yarn mallets and one wool/wool yarn mallet. The wool yarn warms the sound, the synthetic yarn provides articulation. In describing her mallets Ivana has created a scale that utilizes the language of vocal range and timbre. Her definitions for each mallet combine the ideal playing range for a mallet with the color/timbre of its sound. Note: The scale follows a hard to soft progression, but loosely, as hardness alone is not enough to define each mallet. Interested in this item? Please email us at info@harmony-music.com for prices.